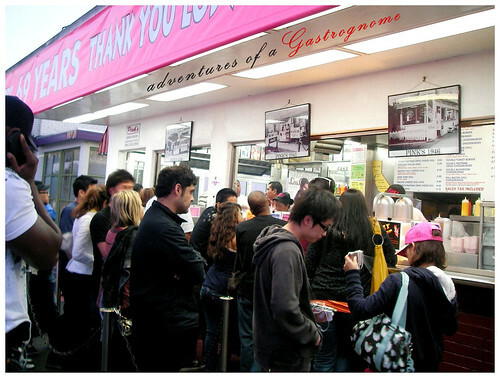 Pink’s Hot Dogs is the infamous gourmet hot dog place in all of Los Angeles, in whole of the world even. 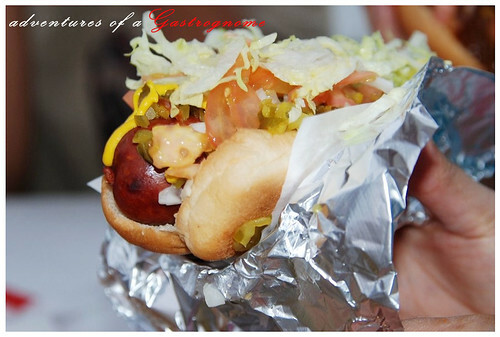 A family-owned hot dog stand since 1939, and a legend at that! 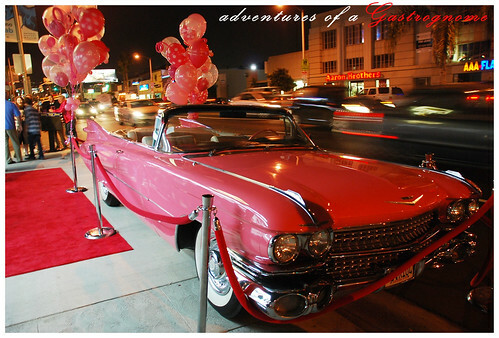 It is hailed by celebrities, well-known dignitaries, A-listers, corporate VIP’s, chefs and foodies alike! 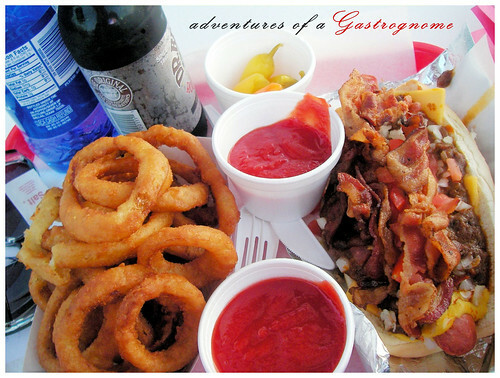 Bacon chili cheese dog ($5.20+), onion rings ($2.95+), Dr. Browns root beer ($2.00+) and bottled water ($1.40+) are what I ordered during my first visit. It’s one of the great American comfort food, hell yeah it’s nice and greasy. You've got to do movements and drills where the calorie, fat and cholesterol count. So whenever I would like to set off to this dog institution on the corner of North La Brea and Melrose, I jog exactly 9.3 miles or 14.96 kilometers (according to Google Map) one-way, and walk (since I’m full) my way back to home. It’s never a pain to locate Pink’s given how long the line usually is. Last time I went here, I stood 80 minutes in queue. It was late at night then, when the stand becomes packed with club and concert goers, but in less swarming hours, usual waiting time is 30 minutes. The mood of it is akin to a dog-stand-meets-fast-food. The service crew though tends to perform tasks in a systematic way, shipshape and efficient! Once you get in the head of the line, you’ll be out in no time. 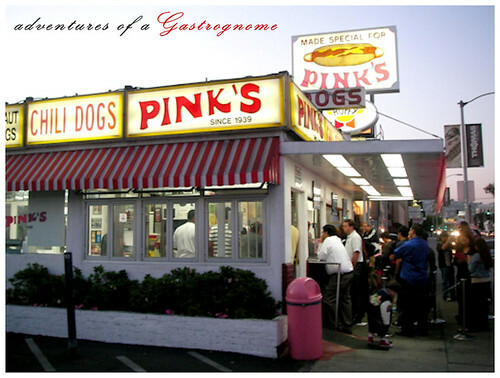 Pink’s even claim that an average chili dog can be ordered, prepared and delivered to the customer in less than 30 seconds. 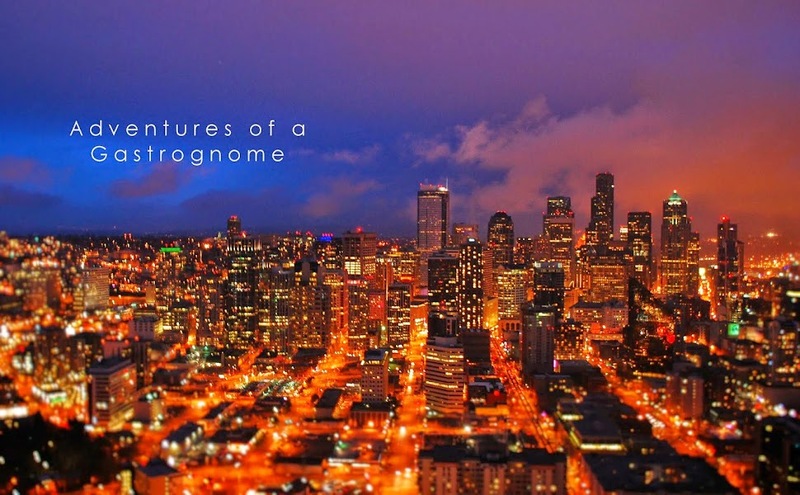 How fascinating is that! 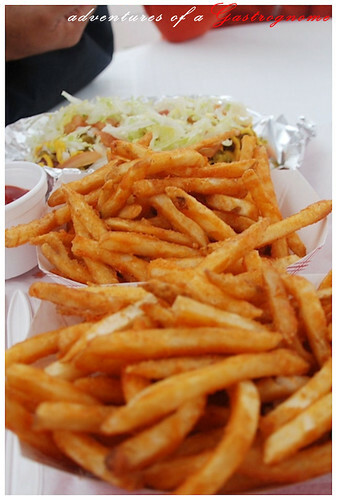 This Hollywood staple is worth the jog and the wait; that, I vouch for! Sufficient indoor and back patio seats are available. Inside walls is filled with autographed photos of celebrity patrons like Bill Cosby, Jennifer Garner, Jay Leno, Aerosmith, Celine Dion, Snoop Dog, Bobby Flay and Martha Stewart. 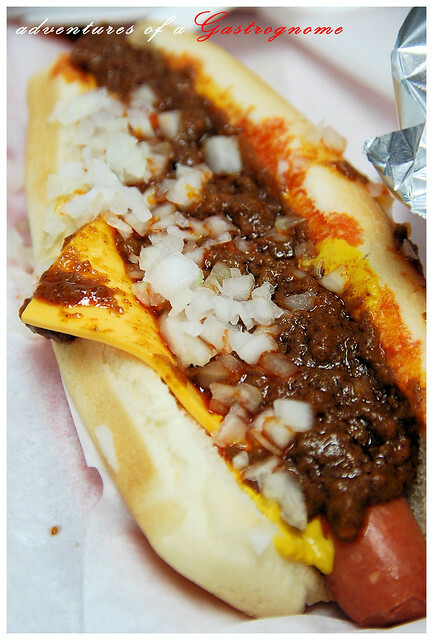 What makes this relished for more than 70 years is the famous and wondrous snap when you bite into their hot dog. Snap is due to the natural casing. It’s the slight resistance, so satisfying to the teeth. 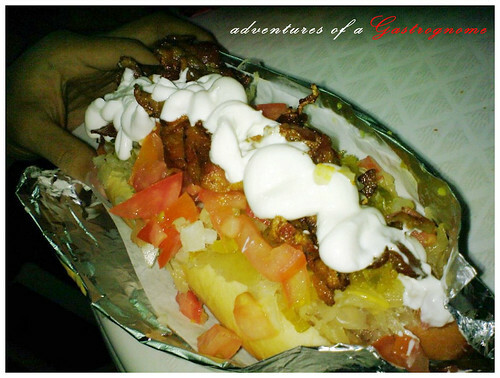 Their hot dog is of good quality because it’s custom-made Hoffy-brand, all-beef wieners, nice flavour and texture. Add this to their fresh, light and fluffy buns, and then top with mustard, onions and pour a mildly spicy thick stew of cooked-down meat. 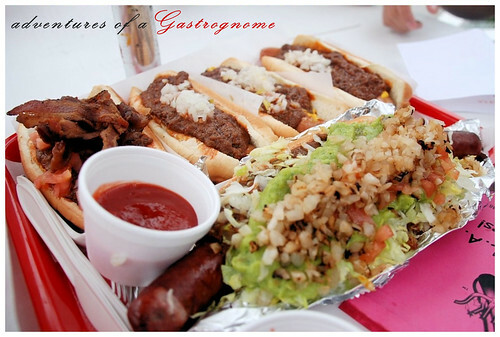 Oh la la, you’ve got yourself Pink’s chili dogs – a must-eat item! In front is Millennium Dog ($5.65+). The menu is startlingly extensive with all the numerous dog combinations and possible toppings of relish, onions, tomatoes, bacon, Nacho cheese, American cheese, guacamole, sauerkraut, sour cream, onion rings, pastrami and etcetera, plus a selection of hamburgers and desserts of which I have never tried. They’re generous as you can see, very generous that to some extent, presentation becomes a sloppy mess. If muddling and untidiness puts you off, you shouldn’t be at Pink’s. Their hot dogs are chaotic to consume, but not to worry, they have piles of napkins and with everything that’s going on inside your mouth with every decent bite, you’ll love this! Chili, with real beef and a delicious blend of spices and seasonings, is a fitting complement to all dogs! This is a standard, their distinctive flag, a customary order at Pink's. 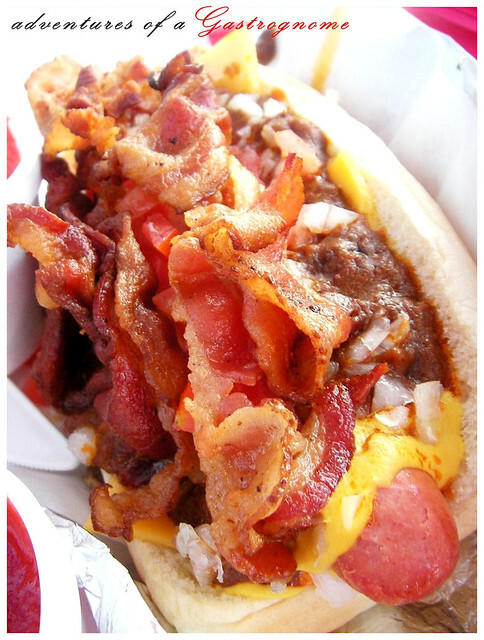 Bacon Chili Cheese Dog ($5.20+) is my personal favourite. Mustard is spread first on the soft warm bun, followed by a slice of cheese, then the hot dog. Topped with three strips of bacons and a helping of chili, cheese and tomatoes! 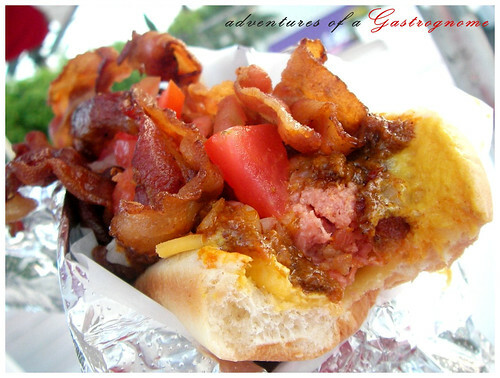 Just by adding fried-to-crisp bacon, this gourmet hot dog propels it to be over the top, and though chili might get a bit lost in the shuffle of plateful of the other toppings, its twist always comes out overwhelming. It’s my sinful pleasure!